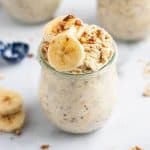 Another Overnight Oats recipe? Well, of course! School is almost back in session so it’s time to stock up on ideas for quick and easy make ahead breakfasts. There really isn’t a breakfast that is easier to make, or at least one that will also fill you up with all sorts of goodness. These Cinnamon Raisin Overnight are so simple but still so delicious with cinnamon, raisins and a touch of cashew butter. It technically should be Cinnamon Cashew Raisin but that is a bit of a mouthful! And technically, cashew butter, almond butter or even something like sunflower butter can be used for these. As always, you can make your oats gluten free using gluten free oats. 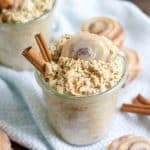 You can make these dairy free and if you are vegan, these will work for you as well! Overnight oats really please the masses. The thing I love the most about these recipes is they help so much with food prep. One of the most difficult things about eating clean is finding something convenient and fast that also has real food ingredients. Food prep is your best friend when it comes to sticking to healthy choices. I typically make three or four individual jars at a time so I am set for several days to a week at a time. I usually eat them warmed up but having them cold can still be tasty. Oh, and don’t forget to check out all the other overnight oats recipes I have here. I will compile one post with all of them soon. But for now, enjoy! 2 tsp cashew butter almond butter will work too! Combine all ingredients into a small jar or bowl that can be sealed. These are ready in the morning and you can eat them hot or cold! Looking for some more ideas for overnight oats? Here are a few of my favorites! How do you serve it hot? When do you bake it to make the bread? Hi! I just pop it in the microwave for about 45 seconds or so in the morning to warm it up. I’m not sure what you mean about baking for the bread. Can you clarify? Thanks!